There has been lots of publicity about this year’s Big Friendly Read - every library we’ve visited recently has colourful displays promoting the Summer Reading Challenge for children - and there has been lots of coverage in local papers about the range of activities available for children in the summer holidays. While parents may welcome the rest and enjoy having their children occupied, for anyone who just loves reading, we’ve noticed that there are also a growing number of challenges aimed at grownups. 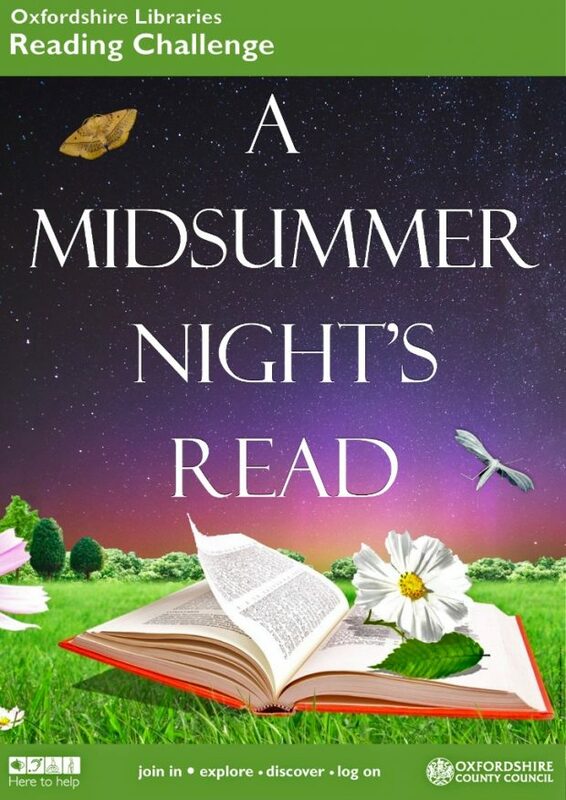 The Adult Reading Challenge in Oxfordshire, A Midsummer Night’s Read, has got off to a good start. We are running the challenge between 9 July and 10 September with a Grand Prize Draw afterwards (drawn from those who successfully completed the challenge) - the prizes will be announced at the end of September / early October. Great support this year from local businesses and organisations – double the amount last year – due to greater community awareness. There is no doubt that this enhances the take-up from library members! 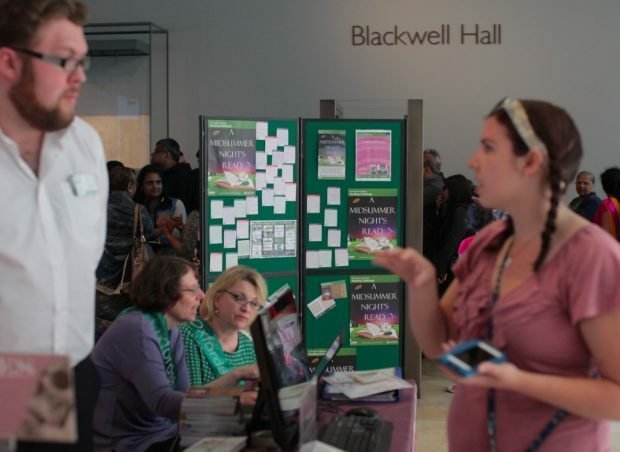 The launch event this year was the first we have done and was in a unique environment – Blackwell Hall of the Bodleian’s Weston Library – which is a new venue. We were able to reach a different client base and promote the AMNR as it related to their Shakespeare is Dead exhibition. We spoke to over 150 people promoting the public library service, the AMNR and also the children’s challenge. We were able to interact with Bodleian staff on the ground and there was a positive vibe from them once they got used to the vastly different type of event it was from their norm! This is the 4th year of this event. Year 1 was very low key and targeted to an area of deprivation in Oxfordshire. Year 2 was countywide, had 6 prizes and 3 ‘speed-dating with a book’ style events. The outstanding performance of, and interest in, the Adult Reading Challenge that year arose from an interactive digital poll called Heroes & Villains Play Off where literary characters (a hero and a villain such as Jane Eyre v. Moriarty) competed in rounds > qualifiers > quarters > semis > final. Our Facebook and Twitter pages came alive during the whole summer as characters played each other off according to the public vote. Year 3 had 8 prizes and we developed activities in libraries more. Building on the love for a famous TV programme, we constructed Great British Book Off book discussion events (x 8) around a 3-course meal (starter > childhood favourite? ; main > favourite book at the moment? ; dessert > what book do you take to bed with you?). These were very popular, as were our 3 author events for a rising star Claire Macintosh talking about her book ‘I Let You Go’. At each challenge, we have increased take-up either digitally or through the number of people at events or number of postcards (returned by those who complete the challenge). The media interest has been very supportive and so has an increase in business support. It is solely funded internally except this year. The project group plays to the strengths of a team of librarians with a mix of skills: creative, literary, digital, communications. We heard via twitter about Shropshire libraries. Avril Luke told us that Shropshire have been running events for several years; different ones for children, teens and adults. 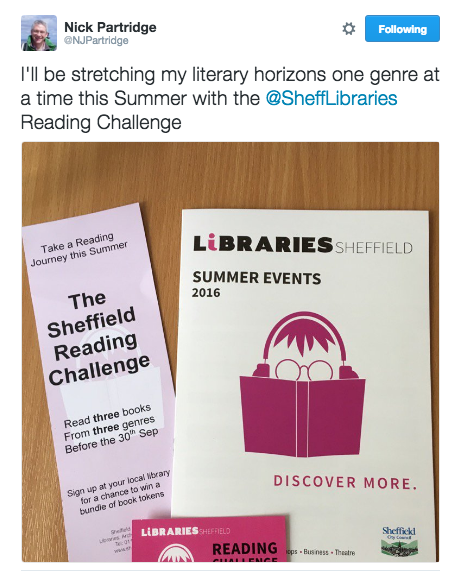 In Sheffield, participants are encouraged to read 3 books, from 3 different genres. Once complete, they submit a card with the 3 titles, and are entered into a prize draw - for book tokens. 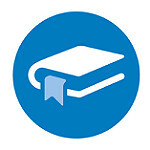 discover a new author - read a book by an author you haven't tried before. Wokingham Libraries have been offering a Reading scheme for adults and Teenagers.